Pastor Andrey and Marina (in Siberia) prayed for, loved, and adopted 3 brothers and their sister before they had ever seen the children. Back row, from left, Nadya (adopted), Anita, Grisha, Nikita, and Timothy (3 adopted brothers). Front row, Yura, Andrey, Marina, Pastor Andrey, and Alina. 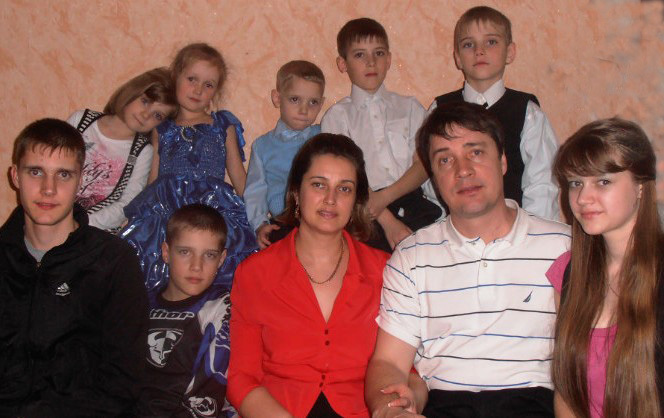 • Pastor Andrey Khoroshchenko, Novokuznetsk, Siberia, first learned of this family when he buried the children’s father, over a year after the government placed the children in orphanages. Thus begins the story of how Andrey and his wife Marina grew to love and then started the adoption process for the four children they had never met. Pastor Andrey continues the story: “As we worked with drug addicts, we saw a lot of destroyed families and abandoned children. We also worked in orphanages so we knew very well the future of the four children. “Marina wanted to adopt a child, so when we learned about the four children, we started praying. We prayed for several months and tried to decide how we could help those children. Only one thing was clear to us: God wanted us to minister to these children. We had never seen them. They had never seen us. “I called to the orphanage and was told that the children had been moved to another city, Anzhero-Sudzhensk, and lived in different orphanages. We started gathering documents. Everything went quickly; we had no problems. Then came our interview with the social committee of the city. They told us that they had been known us for several years, that our church helped a lot with orphans. So they didn`t have any questions and were very happy for us that we had decided to adopt. “When we went to Anzhero-Sudzhensk to take our children from the orphanage, the director was very surprised to see us with all the documents and ready to take children home. They informed us we need orders from mayor of Anzhero-Sudzhensk. Also, we needed to get children’s consent. So we had to wait. “A month later, we could at last take children. They were taken from different orphanages to meet us. We saw each other for the first time. They looked at us very shyly, and when the social worker asked them if they wanted to come with us, they nodded their agreement. I don’t think they realized completely what was happening, who we were and what we wanted. “That day, we welcomed to our family: Nikita, 8; Tima, 6; Nadya, 5, and Grisha, 3. “Physician told us that Grisha had serious problems. He was born when his parents used drugs. He had tuberculosis, chronic bronchitis, HIV, and other diseases. We didn’t expect to hear this, but we knew that God wanted us to serve these children. He is Father to all orphans and widows. “Later, we learned that Grisha was not potty-trained. He had deep wounds in his soul. No one had loved him, nobody had needed him. All the time he lived in fear. At night, he woke up screaming. “Adopting children is a ministry to God. We have about 10 years to put in them right priorities, eternal values, a love for God and His Word. We don`t know if we can do it, but we pray to be able to do it. “On our way back home, the children started calling us mom and dad. I asked if they prayed at the orphanage. ‘Yes,’ answered Tima, ‘we prayed that somebody would take us from there.’ Once again I was convinced that God is not indifferent to such children. He really loves them and wants to serve them. “I should not forget to tell you that Marina and I already had four children, so suddenly our family had doubled. Now, every day is noisy and joyful. One is playing, another is crying, two are arguing, and all of them want to go for a walk. Our home is like a beehive with bees. I take a rest at church, when I work. Each morning there is a line to the toilet. Each day, a new toilet paper roll. We are definitely not bored. Thank you, Pastor Andrey for sharing with us this beautiful testimony of God’s love for orphans! And, thank you to all of our Big Family partners who make it possible to embrace and encourage this family with prayers and financial support! Join with us to help bring about a Russia with No Orphans! www.BigFamilyMinistry.org .